This piece is the first of a series of works focusing on fun, small, decorative pieces with particular attention to the andamento. Andamento is the term used for the flow of the tiles, which gives each piece description, rhythm, movement and life. 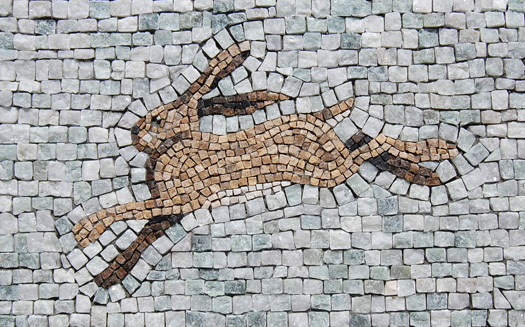 With the hare, a very traditional way of applying the andamento is used. The ancient hammer & hardie was my main cutting tool; unparalleled by any modern method for precision and power. The subtle colors of marble were embraced by thinking of the design in simple flat tones, letting the flow of the tiles give you all the information and movement. The choice of this animal, besides seeing them quite a bit recently in the yard, is a nod to a classic subject in its most quintessential pose ... mid-flight.